Posted on Sun, Jan 22, 2012 : 5:49 a.m. The Juliets play The Ark on Monday. rock? In the case of The Juliets, the answer is definitely yes. Led by singer-songwriter and multi-instrumentalist Jeremy Freer, The Juliets may utilize classical elements in their music but they remain rockers first and foremost. I’ve been both intrigued and captivated by this Detroit/Ypsilanti-based quintet ever since I heard their self-titled debut album in 2010. They’re equally brilliant live, and sounded particularly good performing at Top of the Park last year as part of the Ann Arbor Summer Festival. Recently I spoke to Jeremy Freer about his group’s second album, "Perfect Season"; past projects; and audience expectations. Catch The Juliets when they play tomorrow night at The Ark. Q: What did you do musically before forming The Juliets? 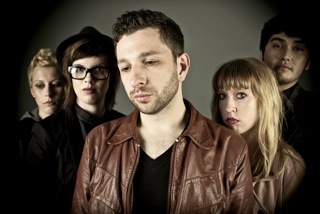 Jeremy Freer: My last band was Freer, and it was definitely more a of a traditional rock band. I played piano, we had a lead guitar player as well, and it was pop-rock music. But where The Juliets lean toward a classical interpretation of pop and rock, Freer had a heavier R&B and jazz influence. Musically speaking I’m very schizophrenic, where one second we want to be as heavy as possible, and the next second we want to be really delicate; Freer was like that to an extent. The only way I can make music is to completely indulge in whatever it is that I want to do; otherwise I’d be completely bored and there would be no point in being in a band. Q: How is "Perfect Season" different than The Juliets’ first album? Freer: We wanted a more immediate sound right away, something a little bit more up-front, and that has to do partly with the way the record came together. The first record was composed with just the strings and piano and then pieced together. The songs came together more in the studio, so the songs were fully realized there. Everything wasn’t 100 percent completely written before we went into the studio. The new record was completely written before we went into the studio, and we definitely wanted a heavier sound. We always had a heavy rhythm section going, but we wanted to take that to a heavier place on the new record. The first record got labeled chamber-pop, which we understand, except I’ve always kind of considered us a rock band with chamber-pop elements. It’s an attempt to mess with the formula of rock music but still be a rock band. Another difference is that our first record didn’t have a steady rhythm section, but now we have one with (drummer) Jax (Phillips) and (bassist) Ashton (Hopkins). Having them as a permanent rhythm section did influence this record. They are really bold players. Jackie is one of the heaviest drummers I’ve ever played with. My favorite drummer is John Bonham of Led Zeppelin, and she’s the closest I’ve played with to somebody like that. Q: Do you write all the words and music for The Juliets? Freer: Yes, I write all the songs, although I don’t necessarily write everybody’s parts specifically. I bring them to the band and although I have an idea of where I want things to go, I don’t write everybody’s parts. It's more like I bring the songs to them and they put their thing to it and it becomes what it is. The soul of it stays the same but aesthetically and dynamically it changes a little bit with everybody’s influence. I have between 20 to 30 songs written to choose from when I’m doing a record. Q: Would you say that some audiences are challenged by the unusual sound of the band? Freer: Yes! I feel like there’s not a lot of middle ground about the band. People are either really into it or else it’s just not their thing. Most people really respond to it positively and connect to it. They’re really excited because there really isn’t anybody else doing exactly what we’re doing. There are a lot of bands that use strings and orchestration, but often they’re just for ornamentation to surround the big, macho lead guitar player standing out front. That’s not the way we’re trying to meld these elements. When you listen to any good rock band a lot of the riffs are influenced by classical music, so I don’t feel like were doing anything strange. But nobody’s really done it like this; I don’t know why. The Juliets perform Monday night at The Ark, 316 South Main Street. $10. Doors open at 7:30 pm. For tickets and information: www.theark.org or 734-761-1451.